We live in an image obsessed, fat phobic, one size fits all kind of world where we spend our whole lives trying to live up to an unrealistic expectations of beauty that is impossible to attain and it’s killing us. Body image issues and eating disorders are destroying the lives of boys and girls, men and women and it’s time to take a stand! We live in an image obsessed, fat-phobic, one-size-fits-all, thin is in, skinny jean wearing, thigh gap measuring, binging and purging, body hating society where kids barely out of pre-school are begging their mothers to keep them home from school because they feel like they’re just too fat to fit in! The Body Image Survival Guide for Parents by Marci Warhaft-Nadler is a must read for every parent raising a child in the 21st century. A negative body image is a contributing factor for developing an eating disorder. Eating disorders are on the rise in children. There was a 119% increase of eating disorder related hospitalizations among children under 12 years old between the years 1999 and 2006. Watching a family drop off their daughter at the Victorian – Eating Disorder Treatment is heart breaking. Emotions are high; crying, screaming and bargaining are all quite familiar. Our staff calms the parents and client reminding them that they are making a wise decision to seek help for this deadly mental illness. It is a scenario every parent dreads – acknowledging their child is sick and in need of professional help. Many question if anything could have been done to prevent the eating disorder? A genetic and social disease, preventing eating disorders is hard to quantify. 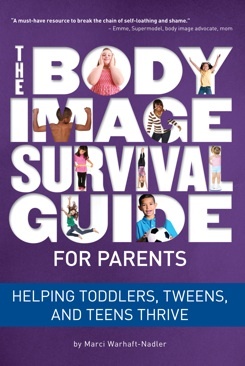 However, a new book titled, The Body Image Survival Guide for Parents by Marci Warharft-Nadler, eating disorder survivor and Certified Personal Trainer provides several preventative tools to navigate a child towards a healthy body image. My favorite thing about the book is the way Nadler breaks up the chapters with real questions from parents. The “Dear Abby” format of the book quickly makes it seem as if Nadler is simply one parent talking to another. I highly recommend The Body Image Survival Guide for Parents to parents, teachers and school counselors. I decided to send my Huffington Post article about Childhood obesity to a fairly well-known local fitness team and asked them for their thoughts. I did this, knowing that my article “Childhood obesity is not the problem” is a tad controversial. In my post, I discuss the dangers of anti-obesity campaigns and the fact that I believe we need to focus less on weight and more on health. I was genuinely interested in hearing their thoughts as people who have spent the last 25 years or so, offering health tips to families. They responded by saying, “The author is missing point. I think she is taking the topic and twisting it to write an article.” I wrote back explaining that I am, in fact, the author and that while I understand that there’s a health crisis in this country, focusing solely on weight is completely ignoring all of the other factors that play into our kids overall health and well being. I was really looking forward to the discussion that I was hoping was going to follow. Afterall, we’re both trying to reach the same goal and I believed in the benefits that could come from extremely dedicated people approaching the same issue from different angles. Sadly, that’s not what happened. Not only did the conversation end, but my entire post had been deleted from their Facebook page. What this showed me was that some people are so stuck in their own opnions, that they aren’t even willing to consider that there may just be another way to look at things. I wasn’t looking to completely change their outlook, just expand it a little and I was just as open to the possibility of learning something new as well. Here’s why I find this SO FRUSTRATING: There is hardly a lack of weightloss experts, programs and campaigns out there trying to make us lose weight and yet, obesity is still an issue. Maybe, just maybe, it’s time to look at things in a different way. If we keep banging our heads against the same “Skinny means healthy” concrete wall, nothing will ever change. Do I believe that I have a TON of knowledge to contribute? Yes, I do. But I am also not so arrogant as to believe that I have nothing left to learn. We all know that childhood obesity is a problem, but here are a few things most people don’t know. Fact: In Canada, for all the kids who are overweight, there are even more kids who are NOT but THINK that they are. Fact: It can be extremely difficult to find treatment for eating disorders due to lack of resources or finances. Fact: Some people suffering from eating disorders find it nearly impossible to be taken seriously if they don’t “look the part”. It’s easy to look at someone who weighs as much as 380lbs or as little as 80lbs and recognize that they probably have a problem but someone battling a severe eating disorder can look healthy while slowly dying inside and can be overlooked even by medical professionals. Fact: Anti-obesity campaigns tell kids they need to be skinny to be healthy by focusing on numbers, but we are more than just numbers and our self-worth should not be measured in pounds. I understand that obesity is an issue, but I also understand that it is one of several issues that need to be tackled simultaneously if we have any chance of truly raising healthy children. While I understand this, there are way too many people who refuse to see the bigger picture and choose only to look at fat as the enemy. For there to be any chance of us finding solutions to the health crisis we’re facing, and for our kids to stand a chance at the long, quality filled lives they deserve, we need to fight the risks of unhealthy living instead of eachother. If we let ego get in the way of progress, WE may feel better, but our kids won’t get any healthier. Body Image Pledges for Parents and Kids: A promise to be good to ourselves and eachother! I promise to believe in myself and to reject the unrealistic and unhealthy ideals that may be thrown at me by society, the media or marketers trying to profit off my bruised self-esteem. I will lead; not follow. I understand that nobody can make me feel bad about myself unless I let them. And I will not let them. I believe in myself and I am amazing just as I am. I promise to always treat myself with love and respect. I promise to be proud of who I am and not let anybody make me feel like I’m not good enough. I won’t judge other people on how they look because it’s what’s on the inside that matters. I will believe in myself and follow my dreams. I don’t have to be perfect. I’m great just the way I am. I don’t need to be exactly like everybody else, because I am unique and special in my own way. I’m me and I’m magnificient! SELF-WORTH SHOULDN’T BE MEASURED IN POUNDS! Mayor Bloomberg, do you want us to be healthy or just skinny? The judge has spoken, the ruling’s been made and our right to drink super sized, sugar loaded beverages remains in tact. I’ll be honest with you and say that I’m feeling somewhat conflicted by the decision. I know that the main argument against the ban was from people who just don’t want the government telling them what to do. Nobody likes to be told what they can and cannot eat or drink and people tend to get a little annoyed when they feel like their being treated like children, or fools, or foolish children. That said, who the hell needs to be drinking soda from a cup big enough to swim in, anyway? If you’re still thirsty after drinking enough liquid to bathe in, you’ve got some bigger issues that need to be addressed. I have no problem with Mayor Bloomberg wanting to limit the size of sugary drinks being sold, what I do have a problem with is that, once again, he is completely missing the mark on doing the HEALTHY thing. WHY is drinking copious amounts of sugar-laden drinks unhealthy but consuming the same amount of chemical filled crap just fine? WHY are we protecting people from the evils of sugar while promoting, accepting and even encouraging the consumption of chemicals that come with risks related to health issues like depression, severe migraines, inflammatory bowel disease and Cancer? Oh wait a minute, I know, because they have less calories! Calories are bad because they make you fat and fat is bad, because it can lead to health issues. Can you see my concern here? Why is that certain health risks are acceptable as long as they don’t affect our size? Why are we, once again, putting our weight ahead of our health? He’s the really crazy part, some research has suggested that artificial sweeteners can lead to, say it isn’t so, OBESITY! I have no problem with the government wanting to help us get healthier, but I do have an issue with it just wanting to make us skinnier. I work with kids as young as 7 and 8 years old who have already started counting calories for fear of getting fat and that’s just not okay! If we want to raise healthy children we need to teach them that eating well makes them FEEL good, instead of promoting the dangerous messages that eating less makes them look skinny. Time to stop trying to lose weight and start focusing on gaining HEALTH!